Home / News / Sunderland soars! NGCV is proud to support our neighbours, Sunderland, as they launched their Twenty Four Seven programme under the Sunderland Culture banner today at the National Glass Centre. We and the other cultural partnerships across the North East were there to see the unveiling of Sunderland’s ambitious plans to build on the momentum of their unsuccessful City of Culture bid, which invigorated and galvanised the city in an incredible show of ideas, imagination and aspiration. We are pleased to support Sunderland in this next stage and with their transformational programme, which builds on that momentum and raises the bar of the city's cultural ambitions. 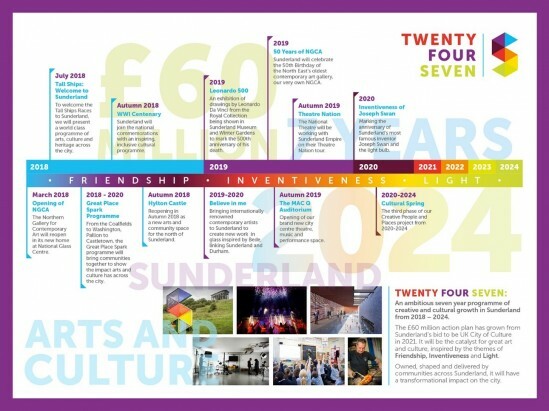 Keith Merrin, Chief Executive of Sunderland Culture and Rebecca Ball, the newly appointed Creative Director, outlined the Twenty Four Seven plans. "It is an ambitious seven-year, £60m project that will take the city up to 2024. It will improve the city’s cultural profile and reputation, strengthen the city’s creative economy and increase the number of Wearsiders taking part in arts and culture." It incorporates the themes of Light, Friendship and Inventiveness which were so strong in the City of Culture bid and will deliver much of what was in that plan. Sunderland Culture would like everyone’s support and you can sign up and follow them on Facebook, Twitter and Instagram . There will be lots more exciting announcements to be made over the next coming months in the lead up to Sunderland hosting the Tall Ships and we urge everyone to continue supporting Sunderland on its cultural journey.